When I was a kid teachers would often ask me my reasoning for whatever mistake I had made that day. I would then give them the reason asked for only to be cut off by the statement "I don’t want to hear excuses!" 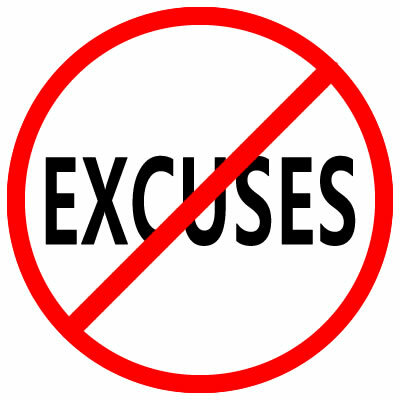 Over the course of my life I have heard this statement over and over in various iterations down to the most basic "no excuses" and I want it to stop. I guess it boils down to understanding what the meaning of the word excuse is: A reason or explanation put forward to defend or justify a fault or offense. So, if I buy a burger and you ask me why, my response of "I was hungry" is an excuse. Wouldn’t that be an explanation? Well, the definition for explanation is almost the same: a reason or justification given for an action or belief. I guess the similarities arise when someone asks you “what’s your excuse?” The answer could be considered both an explanation or an excuse. The confusion comes from how general society has reengineered the meaning of excuse to mean: an attempt to lessen the blame attaching to (a fault or offense); seek to defend or justify. "I was in a fender bender." "I’m tired of your excuses." The accuser has now changed the explanation into an excuse implying that the explanation was a complete fabrication. Nevermind the fact that the second person could probably show the damage on the car or the record on their cell phone showing a 911 call. Maybe they always give excuses. And that may be true, but it does not merit the dismissing of an explanation out of hand. And this is where my annoyance stems. I am not habitually late, nor do I provide a plethora of excuses, but I have too often been the recipient of the No Excuses beratement. If my explanation is lame and should have not caused the problem, I will say so. There is no need to declare me a liar. Calling you a liar is mean. And that is why they say No Excuses. That is a perfectly acceptable statement in society that does not convey the meaning that the person is necessarilly a liar. So they use it instead of what they really mean, which is: "I don’t really care why things went wrong, I’m just mad that they did and I want you to take the blame and apologize." No need to be. We all get frustrated when things don’t go our way, but we don’t want to say it in fear that someone might think us a 5 year old. You’re not 5 and your feelings are valid. I hate it when things go wrong too, but calling me a liar isn’t the solution. Saying "I’m frustrated that you’re late" will still prompt an apology from me without exasperating the situation. We should all try to be nicer.